A-ha moments. Lightbulb moments. “Duh!” moments. Whatever you want to call them. We all have them. And you know what, they amaze me. Every. Single. Time. And it’s crazy how they work. You’re just going along, minding your own business when something happens or someone says something or you see something or you do something or whatever. And then….BAM! WHAM! It happens. That moment. That one minute, that one second when something clicks. And you get it. You just flat out get it. You all know what I am talking about, right? Good. I knew you would. Well, that moment happened last night (Tuesday, February 10) for me. And I have to say, it was pretty amazing. But, I have to say that although it was an a-ha moment, it was also kind of a shocking moment. Yes, they are different. And it was not only shocking for me, but for my son. To be honest, I am not entirely sure who was more shocked – me or him. I was at Vital Fit Club taking a boot camp class, which by the way, was AMAZING and so much fun. 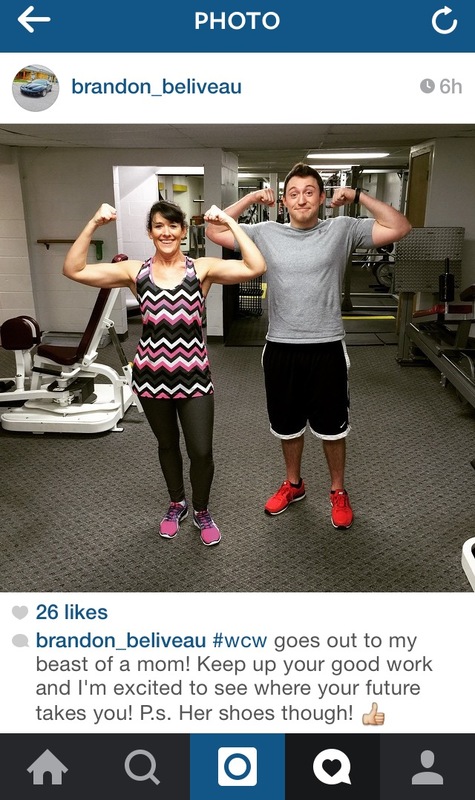 Anyway, my son, Brandon, was also there working out. Doing his weights and stuff. After class, I went downstairs to where Brandon was and we were talking. As usual, I thought we should take a pic. If you haven’t figured it out, I kind of LOVE pictures. 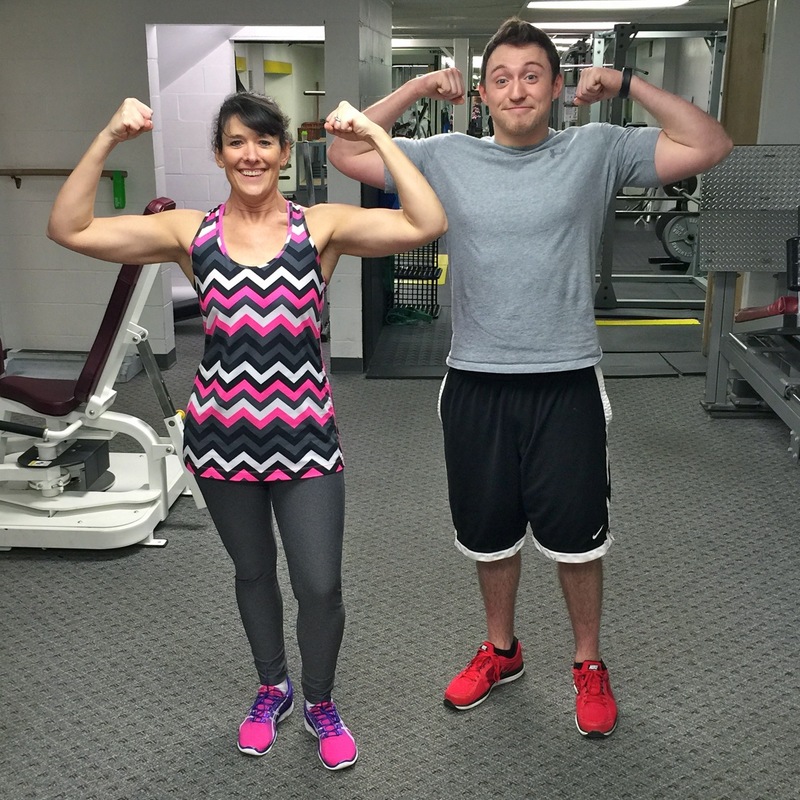 We were being kind of goofy, but kind of serious and a friend of Brandon’s, who was also working out, took our picture for us so we could “show off” our “big” muscles. (Okay, maybe Brandon’s big muscles. Not mine.) Of course, Brandon made his typical, o-m-g-another-stupid-pic-with-my-mom face! See, doesn’t he looked thrilled? After we took that photo – and I was “kind of” shocked that my arms actually had a little definition – I thought, “You know, I wonder what I look like from the back?” Because, really, whoever looks – I mean really LOOKS – at their backside. I know I don’t. So, I asked Brandon to take a picture of my backside. Strange? Maybe. But I wanted to see. “Wow! Mom? Wow! Mah-ooommm!” A shocked Brandon said. (Or it was close to that!) I didn’t know what to think. I didn’t know what he saw. I didn’t know what he was looking at. I thought for a split second something was wrong because he sounded SO shocked. Seriously, he was genuinely shocked. Like, for real. I said, “What? What’s wrong?” He said, “Nothing. You have muscles. You’ve got definition.” Or something like that. I said, “Really?” And then he took the picture. Well, after he moved me into better lighting so the picture would REALLY show the definition, he took the picture. And that’s when it happened. My a-ha, lightbulb, holy crap, DUH! moment. The effort I make, the work I put in. 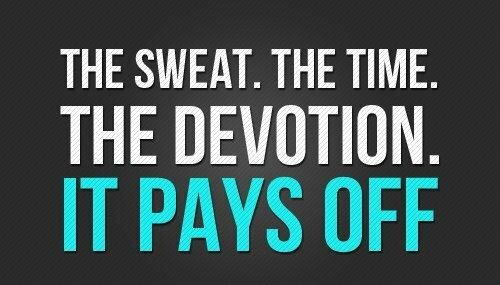 The sweat and soreness. It does/did actually pay off. I think I – along with the rest of the world – get so focused on what we can only see in front of us that we don’t realize that there are things happening – changes being made – to parts of our bodies that we don’t see. That we don’t take the time to see – or even feel for that matter. Throughout my journey of losing my weight and now maintaining my 60-pound loss, I know that my body has changed. I can see it (most of the time) and yes, I can feel it. But at the same time, I can’t. Or don’t, for that matter. For example, my legs. I despise my upper (mostly inner) legs – the part where it hinges into my hips on down to my knees. The inside – the jiggly, wiggly, gross inside. Really, truly, I don’t them at all. I mean, I know they are better than they used to be, but I still don’t like them. I guess, I don’t mind my waist, but I don’t care for my pooch of a stomach. And if I am being really critical, which I do from time to time, I don’t like my nose. It’s really crooked. And my stretch marks – oh, my! I won’t even get started. I don’t always obsess over any of it. But I also really don’t LOVE my body. Yes, I am much more comfortable in it than I used to be, but at the same time, I still have issues with it. You know what I mean? For most of the women out there, I am guessing you do. Although I do know that some men are this way, too. Have you ever filled out one of those fun, friendly questionnaire things where a person asks the question, “What’s your favorite part of your body?” or “What do you like about your body?” or something like that. I’ve always struggled with my answer. My typical answer is my eyelashes. Really? Yep. And only if they have several layers of mascara on them. As women, we are so hard on ourselves. We are so quick to nitpick about the things we don’t like or the things we hate. We have a hard time finding anything we like or God forbid love about our bodies or ourselves in general. We struggle to find worth in ourselves. Or to find anything on or about our bodies that deserves worthiness. It’s just hard to do. My new answer? My back. The muscles AND that it actually has definition. I may not always want to work out. I may even loathe it sometimes. But I tell you what. It is SO worth it. Beyond worth it. 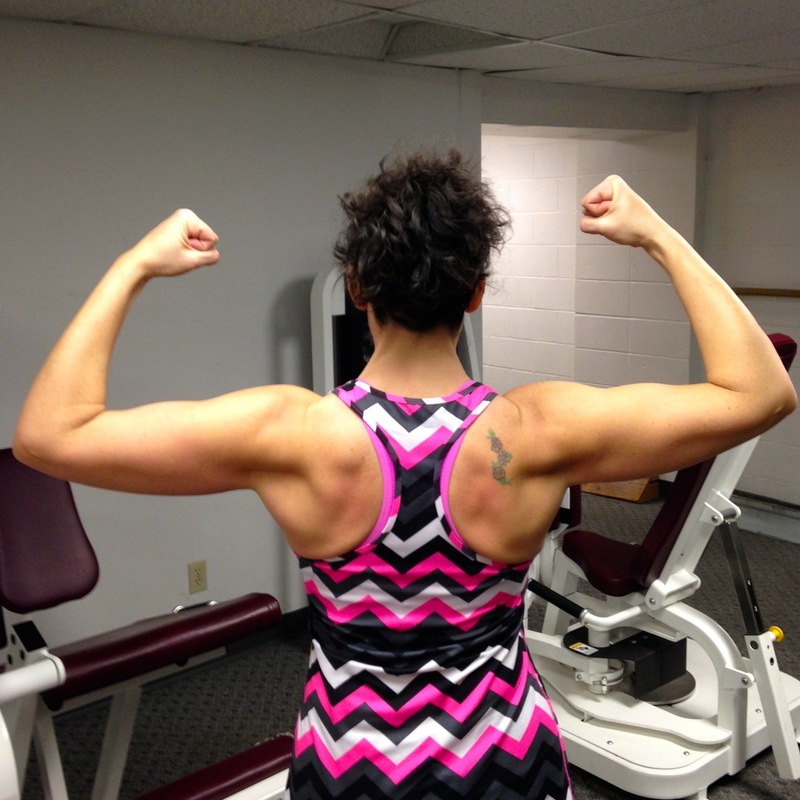 And not just because of my back and my new found defined muscles. It’s the feeling. I feel good. I even feel great sometimes. I feel healthy. Way healthier. And, it’s the worth. It’s the confidence. It’s the strength – both outside AND inside. It’s the respect I now have for my body. Yes, I am proud of how far I’ve come. I am not brag-a-docious. That’s not what I want to do. That’s not who I am. I am just proud. And you know what? That’s okay. As women, we CAN be proud. We should be proud. So, to my women AND men readers out there, I want YOU to answer this question. But, think hard before you answer. What do you like/love about your body? I say, HIS shoes, though! Seriously, they’re awesome! Awesome job and an awesome post! Your hard work is showing, even though you didn’t see it. I am the same way, I still see the fat person I once was, even after losing almost 40 lbs. Then, out of nowhere, a person said to me “you are so slim!” I was in shock. I didn’t see myself that way, even with before and after pics. Sometimes it takes someone else to make us see the progress we’ve accomplished. Love the face Brandon. Love the back Celeste! Love, love, love this! I needed this reminder today. Thank you! Great post and you look amazing! Please stop by my blog http://www.pinkrunningkicks.wordpress.com. I’m following! Previous Previous post: Asthma is for real, my friends! Next Next post: LOTS to talk about!